Last night we completed our 3rd teleclass. Our topic related around some of the myths about becoming a freight broker and operating a freight broker business. There are more myths than you can shake a stick at. If you want to learn the real scoop about what's going on, you may subscribe to get automatic updates when I post a message here. In the upper right hand corner of this blog, just enter your email address and click on "Subscribe Me". You wan't get spammed and you may cancel at any time. Happy freight brokering to you! You can sign up to get automatic notices each time a new blog post is made. This way, you don't have to keep checking back. Just go to the upper right hand side and enter your email address. You will not get spammed and you can cancel any time. I really appreciate your interest in these free messages and I have received many, many comments via email on how many of you look forward to these posts. You can also leave a comment at the bottom of each blog post. Over 50K Visitors to Our Blog! In a little over two and one-half years, we have attracted over 50,000 visitors to this blog site. That's a lot of visitors! Nearly every week, I get emails or phone calls on how helpful the blog is. So, Thank You for your interest. If you want to be automatically notified each time I make a blog post, just enter your email address in the upper right-hand corner where it says "Subscribe Me". That way you won't have to keep checking back to see if there was a new blog post. We have had over 40,000 visits to our blog site here in less than two years. We have also had nearly 140,000 page views. That's a lot of visitors and page views. Here is where you will find free, practical and useful information. It's right here and you don't have to pay a nickle. Read them yourself. You can receive automatic notices of new blog posts by placing your email address in the upper right-hand corner of the blog where it says "Subscribe Me". You won't get spammed. You will get an automatic notice each time we make a blog post. You need to have Adobe Reader installed on your computer to download and open my eBooks (other than the training manuals). Adobe Reader is free. Just go to http://www.adobereader.com and click somewhere there on the top where it says download Adobe Reader. It's simple and it's free and once you have Adobe Reader installed you are able to open any PDF file that you receive. Would you like to be notified by email each time there is a new blog post here? By signing up with Feedblitz, you won't have to keep checking to see if there was a new blog post. You would automatically be notified. Go ahead. In the upper right-hand corner of this blog, enter your email address and hit "Subscribe Me". You won't get spammed and you can easily unsubscribe if and whenever you like. I appreciate all the nice emails and comments regarding the information that is provided here. Each visit and each page view acts as sort of a vote. After about 1 3/4 years, there have been over 35,000 visits to this blog and over 127,000 page views. That's a lot of visits and page views. Freight Brokering Blog: A Lot of Visitors! That is a lot of visitors. Remember, your comments are always more than welcome. At the bottom of each blog post there is a Comments section where you can read comments from others or you can post your own. Thank you for your visits! I appreciate it. 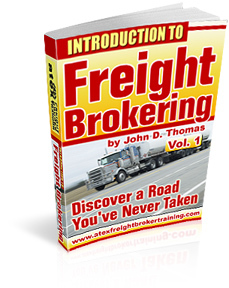 "Introduction to Freight Brokering": Do You Have It? If you are new to this blog or if you have been following it for some time, you still need to order my FREE eBook, "Introduction to Freight Brokering" IF you already have not done so. Once you sign up to receive this eBook, you may receive periodic emails. Some of the information in these emails is not found on my blog here. Tomorrow morning, for example, there will be an email sent with important information related to full truck load brokering versus less than full truck load brokering. You don't want to miss it if you are at all serious about freight brokering. So, to get on the email list go to the right side of this blog to download the free eBook, "Introduction to Freight Brokering". By signing up to receive the free eBook, you are NOT going to get spammed. We don't share your information with anyone else. And you may choose to not receive further emails by going to "Manage my subscription" at the bottom of each email. Freight Broker Blog: Another Milestone! A quick glance at the statistics on this blog reveals amazing results: This past week we have exceeded 25,000 visits and exceeded 100,000 page views! I never dreamed of reaping such interest in just a little over a year. Why is this happening? Because the blog posts are solid, helpful and FREE information. What is even more beneficial is the fact that the information on the blog posts is just a tip of the ice berg compared to what you get with our comprehensive, one-on-one telephone training. Thank you for your visits. Thank you for your interest. Here is a clarification regarding my blog. In the upper right hand corner of the blog, you may subscribe to receive automatic updates every time I post a new message. However, I don't capture your email address and you won't receive emails by subscribing for the Blog Updates. However, to get my occasional emails, you may order the free eBook, "Introduction to Freight Brokering" which is right below the sign up for the Blog Updates. By ordering the free eBook, you will receive occasional emails. But keep this in mind - you may unsubscribe to future emails anytime by going to the bottom of any email and going to "Manage Subscriptions". You may lose out on some important updates by not receiving emails. But you can be assured of removing your email address if you so choose.